2013 was the strongest year for new home construction in the Portland market since the housing boom of the 2000s. And that increase is forecast to continue. New homes in Portland are increasingly in demand, as anyone who is in the process of looking for or buying a new home can confirm. The demand is high while the supply is low. Luckily, new home builders in Portland and the surrounding area are working to fill that supply. According to the U.S. Census Bureau, 11,512 new homes were authorized in the Portland-Hillsboro-Vancouver metro area last year. Almost 1,500 of those home permits were authorized in November and December, indicating a strong beginning for 2014. And while many of the permits were for multi-family housing like apartments and condos, the single family home is still the largest percentage of new homes being built. This indicates that the seller’s market is likely diminishing because builders in Portland are working to increase the supply of single-family homes in the area. Infill building is increasingly necessary in the Portland area, as large pieces of land ready for subdivisions are no longer easy to find. New home builders in Portland are opting to build on the small parcels of undeveloped or empty land within the metro area. This adds to the visual and architectural diversity of the cities and neighborhoods we call home. 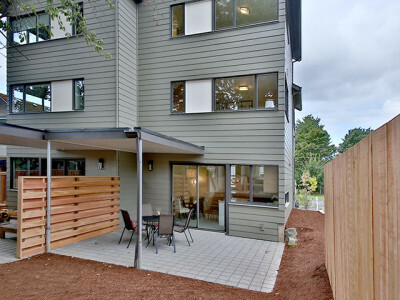 Portland home builders are also challenged with creating designs specifically for infill construction, adding a unique quality to infill builds. The continued popularity of the Pacific Northwest, and particularly the Portland region, indicates that the building of new homes in Portland will increase. The State of Oregon Office of Economic Analysis forecasts that Oregon will experience a net migration of 27,701 individuals in 2014, and a growth of 335,000 by 2020. With such projected growth, new home builders in Portland are working to fill the demand with desirable homes for the people who choose to call the area home. We invite you to view our available and upcoming homes in the Portland-metro area.